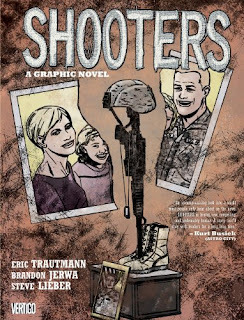 Shooters, by Erik Trautmann, Jerwa Brandon and Steven Lieber, is a graphic novel (read: comic book) that follows the life and times of an Iraq War soldier. It captures the War Is Hell side of a modern conflict, where an individual's struggle is often lost in the noise of every-day life. The Civil War had brother fighting brother and battlefield surgeons using carpenter tools to perform field amputations. World War I had gruesome trench warfare and gas attacks. World War II had the beaches of Normandy and the nuclear detonations over Japan. Vietnam had young men being drafted and images of napam being used in the jungle. But in Iraq and Afghanistan the horror is on a different scale, one that's easy for the non-military citizen to miss. I see Shooters as a book attempting to shine a light on this experience. As a graphic novel, I found that the artwork added to the storytelling and generally helped pull me in. It certainly adds a unique feel to the book and probably helped me stick with it. Which leads to my biggest criticism of Shooters: it's just too dang cliche. The story arc felt like the author was trying to check every box; and perhaps he was. Without going into detail, everything that can go wrong in a soldier's life seems to. I felt myself flipping pages in the book thinking, yep, of course that just happened. I wish the book had more surprises. Ultimately though, I'll cut the author some slack. The fact that topics like PTSD, for example, have become cliche is actually a good thing. That means that the repercussions of modern warfare are seeping into the consciousness of those who have never been on the battlefield. So yeah, there isn't a lot new here. But better to read this story and find it a bit tedious than simply wave your hat at the ballgame when they mention veterans, or tear up watching a YouTube video of a school child embrace a parent they haven't seen in months, and may never have seen again. War Is Hell is a cliche worth repeating.